Consolidated Credit Counseling Services of Canada invests significant resources and countless hours providing free community outreach programs on financial literacy and debt management in communities across Canada. These seminars take place face-to-face, in classroom settings, or even via the Internet through webinars. We work with hundreds of companies, community groups, employee assistance program providers, all levels of government, the Canadian Forces, and non-profit organizations who have identified financial stress as a key component of their employees’ and members’ overall health and productivity. Consolidated Credit educates consumers on the importance of good money management for today and the future. Attendees learn tools in groups or individually to live debt free and financially independent. These educational initiatives have taken root in many organizations across the country. The response to the resources available has grown exponentially – we have educated Canadians through workshop and seminar participation, one on one face-to-face meetings and distribution of our specially designed booklets on financial literacy. We want to put personal finance tools in the hands of Canadians. Consolidated Credit’s goal is to make this free, personal financial education and counselling available to those who may otherwise not have access. In addition, the company strives to educate employers about the value of having budget-conscious and financially savvy employees. An employee that is stressed about debt will be distracted and unproductive in the workplace, and that’s where Consolidated Credit can help. Our educational materials are displayed in common office areas such as break and lunch rooms across the country. We would be delighted to present our workshops and seminars on debt management and financial literacy to your employees, community group or at your corporate wellness event. If you would like to benefit from Consolidated Credit’s tireless dedication to community outreach, please contact us at: [email protected] or 1-800-656-4049 x1030. 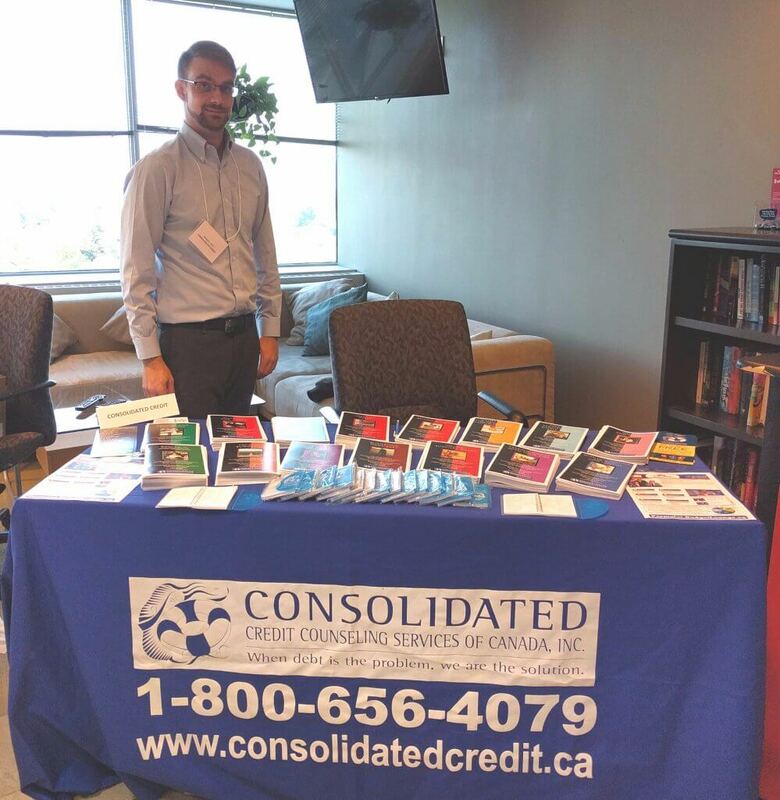 Consolidated Credit’s Community Outreach Manager, Benjamin Allen, at a community event.